Even though SCV is very new, there's already a tier list from the official SCV guide makers. Does Yoshimitsu earn his spot in this one? Is it a tier list from before a patch or after? From what I heard (I was talking with top SC players in Poland), Yoshimitsu is pretty solid in this game. It's a tier list from before the patch. I've heard so as well, that Yoshimitsu is pretty solid. I understand why people can complain in this thread about him losing some of his moves, but he doesn't seem to me like a total loss on first glance. It's depressing to even check this thread. Too many tiers in that list. Devil Jin>>Natsu>>everyone else>>Aeon, Dampierre, Z.W.E.I. Yes Yoshi is solid in this game. The argument was that he lost his "essence" in the process of simplifying movelists. I kinda think it's fitting that he lost his "essence," really. 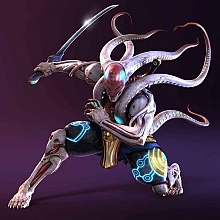 I mean, since it's a completely new man, it makes sense that he would be different from the previous Yoshimitsu.